Visual inspections and preliminary hand-held xray fluorescence analyses of samples taken from Thor have verified the presence of copper and zinc. A maiden three-hole drilling program by Venture Minerals (ASX: VMS) at its Thor copper-lead-zinc prospect in Western Australia’s south west has intersected a 17m zone of disseminated, semi-massive and massive sulphides and confirmed the presence of volcanogenic massive sulphide-style mineralisation along the prospect’s 20km of strike. 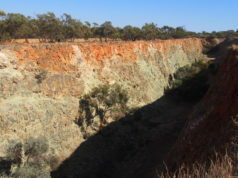 Visual inspections and preliminary hand-held xray fluorescence analyses of samples taken from the prospect, located 240km south of Perth within the Balingup Gneiss Complex, have verified the presence of copper and zinc (chalcopyrite and sphalerite) within pyrrhotite-dominated sulphides. Other elements such as lead, bismuth, tin, tungsten and arsenic have also been identified, confirming Thor’s VMS-style mineralisation. As a follow-up to the drilling program, Venture has commissioned an airborne electromagnetic (EM) survey over its entire southwest tenement package, comprising 281 square kilometres, with a view to identifying higher-grade areas of the same VMS system. The EM survey will target the 20km strike sequence at Thor, as well as other VMS targets within the tenure. The Thor prospect is a priority copper-lead-zinc drill target for Venture due to its scale, EM and geochemical signature, and proximity to the nearby Kingsley base and precious metals prospect, originally identified by a joint venture led by global zinc producer Teck Resources. Following initial discovery of Thor and three additional anomalies to the prospect’s east, Venture worked on extending and refining the known exploration targets. Recently, Venture acquired the northern extension, further extending Thor to around 24km of prospective geology hosting multiple VMS-style targets. Thor is now considered to be “substantially larger in scale” than Kingsley. “Confirmation that the EM signature [at Thor] represents sulphides has substantially raised the prospectivity of the 20km long VMS target,” said Venture managing director Andrew Radonjic. At midday, shares in Venture Minerals were up 21.74% to A$0.028.